Widget displays values of Mac temperature sensors. Is there a better alternative to TempStat? Is TempStat really the best app in Video category? Will TempStat work good on macOS 10.13.4? TempStat lets you view the current values of the many Temperature Sensors found in recent Macs. It supports all G5 systems, G4 Powerbooks (greater than 867), G4 iBooks and MDD G4's. 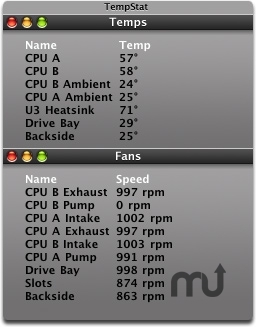 In addition to Temperature readings, TempStat can show you the current speeds of the fans in your system. Note: Support for Intel iMacs and various G3's and early G4's will be added in the next release. TempStat needs a rating. Be the first to rate this app and get the discussion started!